A Mandarin Chinese/English word book to help children learn key vocabulary, with one hundred everyday words illustrated in busy scenes and with labelled pictures. 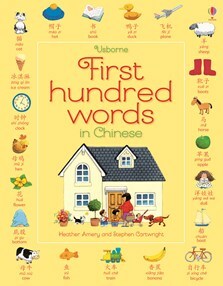 Includes an alphabetical Chinese/English word list with easy-to-use pronunciation guide, and readers can also listen to all the words read aloud by a native Chinese speaker at the Usborne Quicklinks website. All words are written using simplified Chinese characters as well as phonetically using the English alphabet.